(Nanowerk Spotlight) With an increased focus on alternative sources of cheap, abundant, clean energy, solar cells are receiving lots of attention. Harnessing the power of the sun to replace the use of fossil fuels holds tremendous promise. 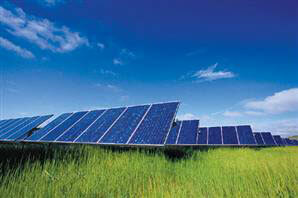 One way to do this is through the use of solar, or photovoltaic, cells. Until now, solar cells that convert sunlight to electric power have been dominated by solid state junction devices, often made of silicon wafers. Thanks to nanotechnology, this is now being challenged by the development of a new generation of solar cells based on thin film materials, nanocrystalline materials and conducting polymeric films. These offer the prospects of cheaper materials, higher efficiency and flexible features. This has opened up new opportunities in solar cell research and development and, consequently, there is considerable investor interest in solar nanotechnology startups. Both inventors and investors are betting that flexible sheets of solar cells used to harness the sun's strength will ultimately provide a cheap and efficient source of energy. Photovoltaics is the technical term for a solar power technology that uses solar cells or solar photovoltaic arrays to convert energy from the sun into electricity. In contrast to first generation solar cells made with doped silicon, the chemistry of the latest solar cell technology is fundamentally different. The primary difference lies in the type of charge that is generated when sunlight hits the cell. In silicon-based solar cells the excited electron and its corresponding hole are immediately separated and can easily travel away from each other. In the new solar cells the charge that is generated is known as an exciton, an electron/hole pair that are bound by Coulomb forces and cannot travel far without recombining (thus losing energy). Excitonic solar cells, such as organic, hybrid organic and inorganic solar cells are promising devices for inexpensive, large-scale solar energy conversion. One of the most important developments in photovoltaics in the last two decades are dye sensitized solar cells (DSSC); they are an exciting variant of the most efficient and stable of the excitonic photovoltaic devices (see our previous Spotlight "Nanowires could lead to improved solar cells"). "Carbon nanotubes (CNTs) have been integrated in organic photovoltaic devices both as an electron acceptor material and as a transparent electrode" Emmanuel Kymakis tells Nanowerk. "CNTs are well-suited for such uses since they can not only efficiently transport electrons, but can also provide a high electric field at the polymer/nanotube interfaces, which favors exciton dissociation." Kymakis, an adjunct assistant professor of Electrical Engineering at the Technological Educational Institute (TEI) of Crete, Greece, published a recent article on "The Impact of Carbon Nanotubes on Solar Energy Conversion". A breakthrough in polymer solar cells was the discovery in 1992 of photoinduced charge transfer between conjugated polymers and buckminsterfullerene and its derivatives ("Photoinduced electron transfer from conducting polymers onto Buckminsterfullerene"). This breakthrough led to the fabrication of several efficient photovoltaic systems that employed a combination of polymer and fullerenes. The charge-transfer mechanism in a polymer matrix containing fullerenes also provided the motivation for investigating the use of carbon nanotubes (CNTs) as an electron transport material. The first report of using CNTs as electron acceptors in bulk-heterojunction solar cells was in 2002, when researchers blended SWNTs with polythiophenes and observed an increase in the photocurrent of two orders of magnitude ("Single-wall carbon nanotube/conjugated polymer photovoltaic devices"). In 2005, GE Global Research observed a photovoltaic effect in a pristine nanotube diode device consisting of two CNTs with different electrical properties ("Photovoltaic effect in ideal carbon nanotube diodes"). Recent advances include a fabrication method for CNT thin films on various substrates including PET (polyethylene terephthalate), glass, polymethyl-methacrylate (PMMA), and silicon ("A method of printing carbon nanotube thin films"). The method combines a transfer-printing technique with vacuum filtration, and allows controlled deposition"and patterning if needed" of large area highly conducting CNT films with high homogeneity. This is an especially promising alternative to the commonly used indium-tin oxide (ITO) as hole-collecting electrode, which is not compatible with roll-to-roll fabrication processing and is also quite expensive, since it suffers from the high raw material cost of indium. The current goal for the research community is to improve the lifetime and efficiency of organic solar cells. "Efficiencies reaching 4.4% have already been achieved and hopefully 10-15% efficiencies are feasible in the near-future upon further optimization" says Kymakis. "Once this obstacle is tackled, the lifetime issue, which is directly related to the cell temperatures, can be explored. A working environment combining the strengths of scientists and business leaders may soon result in rapid commercialization of this technology."